For most of us, we have all heard the saying “practice makes perfect”. 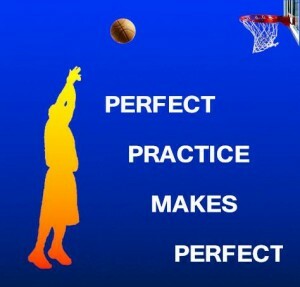 Many years ago I heard an adaptation of this; “perfect practice makes perfect”. This is something I’ve followed to this day and try to relay to others when teaching. Whenever performing exercise, training or playing a sport of any nature the one thing that should come above all others is form / technique. Correct form and technique lessens injuries, engages the right muscles, builds good posture and trains correct muscle memory. The only way to improve this is to practice, practice and practice some more. But it is how we practice that’s the key to constantly improving, developing and achieving maximum benefit. Ok, maybe not so simple after all! When you break it down and go through the movement slowly, you will feel and understand every part of the technique. This is how you truly maximise speed, power and efficiency. As you practise this way, slowly building perfect muscle memory you will be able to let it fly and not think about each step. Instead the muscle memory will do all the work while displaying perfect technique and form. Too often I see people just starting out wanting to slog the punching bag as hard as possible with no consideration for form or technique. Although it may feel good to do so, they’re engaging limited muscles, not getting a total body workout and risking injury. Not to mention they’re learning bad muscle memory, which can be hard to unlearn. Usually they’re only using their arms to punch rather than also engaging their legs and core. If you continue to train like this you’ll never improve or learn how to use your body as a whole. Likewise a power lifter doesn’t walk up to a bar and load all the weights they can find and start lifting. Especially when they’re a beginner learning the craft. Even a professional lifter who may only be warming up won’t do this. This would be a fast track to injury and time on the sidelines. The best way is to seek help from a professional and to do some research on how to correctly perform the exercise. Then start out light and build yourself up with correct form. Where we run into trouble is when we let our ego take over and refuse to believe we could be doing something wrong. Where we think there couldn’t be a better way of doing things. If you’ve ever been to a weight lifting gym, you may have witnessed a person trying to lift way too much for their body to handle, thus sacrificing form and posture and risking major injury. Why? Because of their ego. So they can tell their mates about how much they can “supposedly” lift. It makes me cringe, but dare anyone say something to them and offend their ego. The truth is they probably wouldn’t listen anyway. Nor are they doing themselves any favours. All they are doing is hurting themselves and their bodies. On the flip side, look at someone who follows the “perfect practice makes perfect” philosophy I am writing about – someone who focuses on perfect practice and uses correct form. You will see that this person may start slow but will soon over take the ego driven athlete in leaps and bounds in performance and results. Not to mention they can spend more time in the gym due to reduced risk of injury. Another pitfall can arise when we’re trying to push out the “last rep”. Whether it be that last squat, push up or holding the last few seconds of a plank. Of course we always want to push ourselves to the max, and achieve new personal bests. But this should never come at the sacrifice of good form. This promotes injury and strains on the body. So unless it’s an exercise where you can be assisted by a spotter and keep good form, you’re better off resting and waiting until the next set or aim to make a goal of achieving it in the next training session. Regardless of the sport or exercise, whether it’s boxing, power lifting, car racing, running, yoga or lawn bowls the same principles apply for all, to how we practice and get better. It’s only with constant learning and practice that we will improve. As another saying goes “I am better than I was yesterday but not as good as I will be tomorrow”. This promotes constant growth and learning regardless of knowledge or skill level. So always seek advice on how to best do things, always ask questions on why it’s the best way. Find idols of your chosen sport and study what it is that makes them so great, or how it is they have so much success with a chosen technique. Then break it down systematically while practicing to perfect your technique. If you take these principles to your next training/practice session then it’s a guarantee for success.